The AM/PM is wrong ... it stays in 24 hour format. For example you can't have 15:45 AM can you? I tried to use 24 hour format and the AM/PM disabled on my end. Please see screenshot below. Is AM/PM does not disable when you chose 24 hour format? Please give us the form url so we can investigate. Update: Time (only) field is now released! Sorry about that. Can you please try it again. When I enter 15:45 am I get the error message. Please tell us if you don't see the error message in your end. Hi, yeah I see what you mean ... I think the error message needs to say .. But it would be better if you just restricted the hour field to 12 via a dropdown ... it doesn't make sense to allow someone to add the wrong value in the first place when you have a perfectly good mechanism to prevent it. Yes, that's true. I'll submit a ticket to have both textboxes (hours and minutes) replaced with a dropdowns. The thing about dropdowns though, is that they have an arrow on their right which would increase the space between the hours and minutes. That won't be very visually appealing. Perhaps a better alternative would be to retain the textboxes and have the form's script prevent entries greater than 12 and 59 respectively. 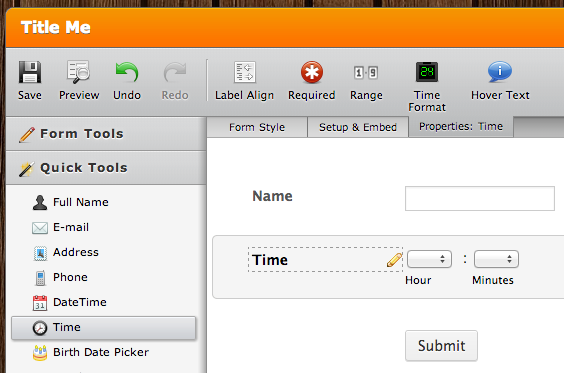 Actually, I just realized that dropdown arrows won't cause any extra spacing between the hours and minutes. Anyway, I'll submit the ticket. I cannot open a ticket for this thread since the title of this thread is unrelated. You must make a request for the feature on a new thread.